In the wake of Barbaro’s injury in Saturday’s Preakness, this article asks whether modern breeding and training practices have so weakened Thoroughbreds that we may not see another Triple Crown winner anytime soon. If so, this is only the most high-profile example of something which has been going on for a long time, and not just in TBs. Horse races in the 18th and 19th centuries were much longer, i.e. heats of 3 to five miles. A 3 y.o. horse is actually quite young, comparable to a person in their early teens; a horse isn’t fully mature until it’s about six–older if it’s a particularly large one. The growth plates harden into bone from the ground up, as it were; the ones in the spine and pelvis mature last. It isn’t just TBs either; quarter horses are ridden in futurities (horse shows, not racing) as young as two, which means they’re started under saddle as long yearlings. They break down early too. Why? $$$$$ The big TB stakes races are for 3 y.o.s; if they do well, they can be retired to the breeding shed early and also their sires (rarely their dams) see their value go up as producers. They’re raced and shown young to maximize the investment as fast as possible. You’re looking at 11 months gestation, then a year or two of training; there’s a lot of money at stake and you want to see results early. The punters aren’t going to sit still through heats of three and four miles either; where those races are still run, they are the province of stronger, mature animals. It isn’t cruel to run a fit horse that distance either (note the adjective); endurance horses can cover 100+ miles in 24 hours and still be hard to slow down at the end of it. They sure aren’t thoroughbreds though. Hyperkalemic periodic paralysis (HYPP), also known as Impressive Syndrome, is an inherited autosomal dominant disorder which affects sodium channels in muscle cells and the ability to regulate potassium levels in the blood of horses. This inherited disease is characterized by uncontrollable muscle twitching and substantial muscle weakness or paralysis among affected horses. 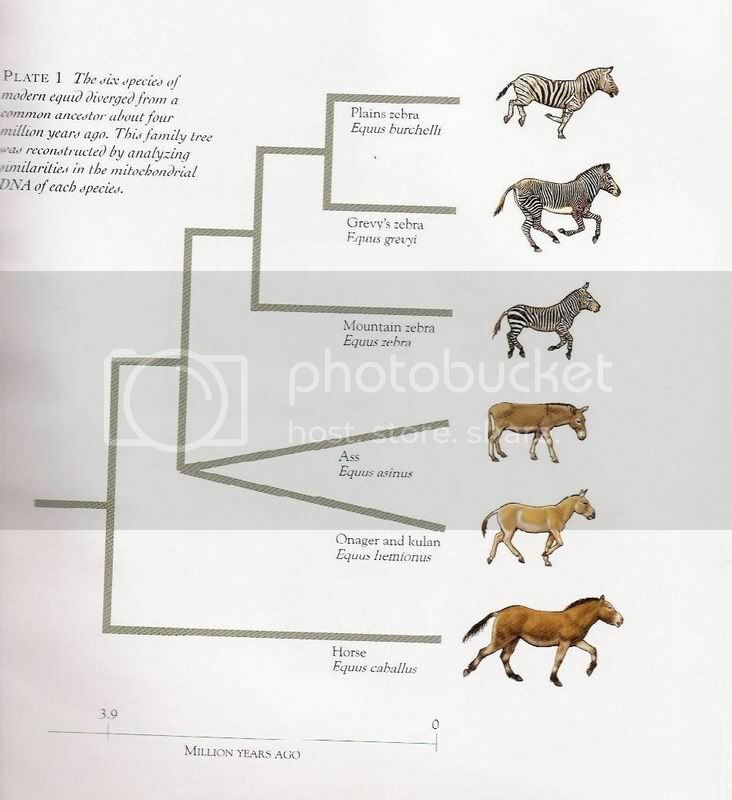 HYPP is a dominant disorder; therefore heterozygotes bred to genotypically normal horses will still likely produce clinically affected offspring 50% of the time. 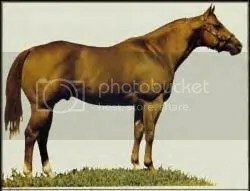 The disease is most common in the bloodline of the famous Appendix American Quarter Horse stallion Impressive, who has over 55,000 living descendants as of 2003. Although the disease is primarily limited to the American Quarter Horse breed and closely related breeds such as American Paint Horses and Appaloosas at this time, cross-breeding has begun to extend it to grade horses and ponies. The spread of the disease is perpetuated by the favorable judgings given to diseased horses in showing, due in part to involuntary muscle twitching which helps to build large, bulky muscles that judges favor. Why are HYPP carriers still being rewarded in the show ring, then, encouraging their owners to breed them on and perpetuate the syndrome? There are many QH owners, breeders and trainers who would like to see N/H horses (carrying one HYPP gene nd thus can pass it on to 50% of offspring) made ineligible for registration; currently horses which are H/H (homozygous for HYPP) will be ineligible for registration as of January 2007. While this will help, it still won’t eliminate the disease from the gene pool completely, and if these horses have an edge in the show ring, is there really any incentive to breed it out?! What people won’t do for a damned ribbon. Other breeds have had their problems; the Foundation Morgan Horse movement was founded in an effort to save rare, pure bloodlines without the popular “show lines”, which have been found to contain legal and illegal crosses to Saddlebreds and Hackneys in an effort to produce high-stepping gaits and “hooky” Loch Ness monster necks for the show ring. Over 2/3 of Morgans now trace back to Upwey Ben Don and Upwey King Peavine. These Saddlebred crosses were legal at the time under the registry rules, but many, many breeders concentrate that blood until the original type is all but lost. The Chantilly Lace fiasco arose when it was discovered that false papers were used to cover up the use of Saddlebred mares. FCF Rhythm Nation was actually crowned Grand Champion Morgan Stallion (one of the judges was his breeder!) and it was later discovered that he was out of a Saddlebred mare! Now, I have nothing against Saddlebreds, or saddleseat, but saddleseat is, for most riders, very “fringey”; the average horse owner shows in Western classes, or hunter/jumper, dressage, competitive trail, etc. ; a “saddley” horse isn’t going to appeal to a broad range of buyers, nor will it attract many new people to the breed. High action, flat croups and Nessie necks are not part of the Morgan standard, and the breed did not need this sort of “improvement”. Sadly, this has really split the Morgan breed into “show people” and “traditionalists”, with the former sticking with their version of glamour and the latter scrambling to preserve the old lines while they can. A German shepherd with floppy ears, short face and a curly coat may be a fine pet but it isn’t much of a German shepherd any more; a horse which is deliberately bred to be unsound or a betrayal of its genetic heritage may be profitable in the short run, but it isn’t doing the animal any favours, and the damage done to the gene pool in the long run can be irrevocable. 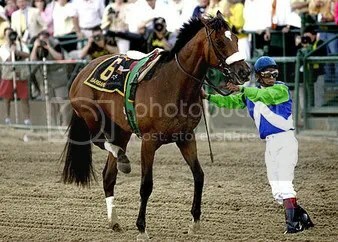 Let us hope that Barbaro recovers and can go on to a fine career in the breeding shed; let us also hope that he was injured as the result of an unfortunate accident and not a congenitally weak leg, lest the gene pool again be the loser in the long run. NB: definitely see Dr. Deb Bennett’s excellent article on conformation, growth, and the history of horse racing. Update: check out this article from The Sporting News, Barbaro’s Injury Forces Racing To Examine Itself as well as my followup post on this topic. From a good post on breeding horses and the American Saddleback……. As for 3DE or dressage, I haven’t really heard of any such malarkey going on. It seems to be something which happens within breeds, rather than in disciplines across breeds, if that makes any sense. The exception *might* be the western pleasure scene, where there have been reports of abusive practices, as opposed to, say, just with QHs or just with Appys. (Does that make any sense? I’m not saying all WP people do that, obviously!) I really hate to see any breed of animal overbred to the point of uselessness, and I’ve never been all that fond of cats or dogs with flat faces or deformed-looking heads. Now, having said that, we do have a Himmy/Siamese cross cat at home, but at least his head is round rather than lemon-shaped. I don’t think there is much of this going on in eventing/3DE. The Thoroughbred and 7/8 TB has historically been the breed of choice, although there has been much discussion recently about whether Warmboods will do better with the recent trend towards a less lengthy format at the international level. So far, the TB and 7/8 TB are still holding their own. The French are doing very well with their breeding program too, which is based on the Selle-Francais breed. However, it seems to me that Eventers have historically not been as concerned with a breed type -“correct” conformation and “heart” are more important. Having said that, I am about to start a series of posts about “unconventional” eventers, the first of which will be about a sassy little 14h mare (of apparently QH origin) who is competing one star! I did some analysis on eventer breeding – if anyone is interested, you can read more here….. Trying that link again – it didn’t work when I clicked on it from here…..
Hmm – I’m sorry, I have no idea why, but the link works when I paste it into my message, but doesn’t when I click on it. I’m sorry to waste your blog bandwidth! One other way to reach it would be to go to http://eventing-blog.com and search for a post titled: Hmmm – Eventing Blog’s Analysis . Facinating article. While I am not familiar with a similar problem in my own breed, I am familiar with the problem of deafness in dalmatians. It has been only through good breeders, improvements in technology and the position of the Dalmatian Club of America that has started to turn around this long standing problem. Only through practice, education and regulation did they start to see an improvment in the standard of the breed. Perhaps other breeds of dogs and horses can learn from this. As for 2 year olds being shown and ridden. TRAGEDY. It should be illegal. In Paso Finos they cannot be shown under saddle until they are 30 months old (and that is by birthdate not Jan 1 rule). Period. And I even think that is too young. With the Arabians, they can’t be shown until they’re 3 and the futurities are all for 3 year old. But the horse can be in the junior horse divison through age 5. Arabians mature later than other breeds and even 5 is pushing it with some of them. I have horsess that I haven’t until started riding until six because they still looked like gawky teenagers. I think all breeds are guilty of this starting them too young. The endurance riders may ride their horses 100 miles in a day but they don’t start them young. Typically when I see an endurance rider looking for a horse they want it to be 5 or 6 and started under saddle. They condition them for years to build up the bone required to safely ride those distances. Also, they have required vet checks within the ride. The horse must be fit and meet required recovery standards or it is pulled from the race. At The Very Heart Of Where The Action Is, originally uploaded by drp. Welcome to the February 7, 2007 edition of horse lovers blog carnival. I had a QH of Skip a Lad and Impressive and that sumbitch was the craziest thing I ever rode. He would ride nic 20 times then the 21, buck like the devil was ridin him. He chased and killed rabbits, ate em too. Was nasty as all hell. Made a damn good cow horse eventually but his attitude was just like his mama’s: Impressive. Or should I say Un? I rode his cousin, a Skip horse, and damned if his attitide wasn’t just the same. Both were HYPP positive and it gave me no ends of trouble. Damn boy tore his own leg off in his stall door a month ago. Miss him but things are a little less stressful. Don’t ever buy into the “popular lines” b.s. I happened to inherit that Impressive jerk, but it was not worth it. Not only is the usefullness bred out, so is the health and temperment. I just lucked out. The little fella bein stunted (spoiled for halter n western pleasure), it was good that he liked to chase things, else he wouldn’t have been good for anything. The Blood Horse recently did a research study and round table discussion on thoroughbreds. It was entitled Losing the Iron Horse . It was an interesting report based on a lot of compiled information. The industry is aware of the problem and they are aware of the repercussions to itself. What they really do about it remains to be seen. I agree that diseases and genetic defects should be more heavily penalized. I think the reason why like in the quarter horses case that such a severe genetic illness would go unchecked because selling horses are so hard in its small market of buyers. So if you make the horse flasheir or just in general overbreed a breeds characteristics maybe someone will buy. In general this should be followed that an animal of a breed must have healthy characteristics. Bull dogs I hear have a considerably hard time in birthing as they have large heads and small hips. I understand why they would have large heads so that they have more powerful jaws but small hips? I think the QH industry is addressing the HYPP issue – the registry will be closed to N/H horses as well. However, I cannot sit here and allow the “Impressive” bashing on your blog to go unanswered. I own two Impressive horses – wonderful temperaments, great confirmation, absolutely the envy of everyone I ride with. HYPP negative. There are alot of Impressive horses that have wonderful muscling and conformation without HYPP. Also, Impressive was originally registered in the Appendix Registry of AQHA, but because his confirmation was deemed to be “desirable stock type”, he was granted full registry, although he was 75% Thoroughbred. Herda, was relatively unknown, and wasn’t discovered until recently to be an inherited trait, like HYPP. However, HERDA genes are widespread throughout the industry – tracing thru Poco Bueno to King P-234. HERDA is recessive, so you must breed two carriers to have a HERDA baby. My buckskin QH is the granddaughter of a known HERDA carrier. So before I breed, I will have her tested for the gene. As far as Breed Registries go – the AQHA has done a wonderful job and spent millions of dollars to find the origins of known illnesses in the American Quarter Horse. I also have English Bulldogs – the English bulldog does not have abnormally small hips – however the puppies do have monstrously big heads, and it is difficult, not impossible for English Bulldogs to bear their young naturally. The English Bulldog is a breed that was saved from extinction, and is on the upswing in popularity. There are already unscrupulous people breeding inferior stock to cash in on the Bulldog craze. I feel we must be vigilant in everything we do to ensure that all animals are cared for – and that includes not perpetuating the proliferation of inferior breeding animals. Jodi, I’m not bashing Impressive; I’m bashing the AQHA and the unscrupulous breeders who would *knowingly* breed non-HYPP-negative animals because they think it will bring them short-term gain. The AQHA deserves approbation for allowing it! You sound like a responsible breeder, and I’m glad your horses are healthy. Great article! It’s definitely a concern to think about. It is sad that in breeding the only true intent is to win, whether it be a race, an event or a show. This is why its important for the organizations to step in and regulate for the safety of the horse. Without the regulating body taking control there will always be this kind of problem.